This makes it very clear their first priority is the safety and health of the illegal immigrants, not the enhancement of border security. Increasing "commercial' hours of operation addresses trade between the two countries, not border security. Without seeing the actual text of the legislation (not available yet) it is hard to comment on this, but these proposals could have some merit. Can't help but notice that money for the wall is "wasteful" and "divisive' while spending on these programs is a "smart...investment", and border issues are "complex", i.e., far beyond the understanding of the rubes who live in the border area. Both Senators are demonstrating their ignorance or unconcern with border security as they are about to pass legislation that would create 240,000 acres of wilderness on or near our border with Mexico which prevents patrolling by local, state or federal officers by motorized vehicles or any use of mechanized equipment. They can only patrol by foot or horseback. I would bet neither one of them has come down to the boot heel and talked to the citizens they are representing. How do you handle 500 illegal with 6 officers in the Border Patrol on duty at any one time. I am extremely disappointed in our state leaders and their lack of care and concern for New Mexico's legal American citizens! 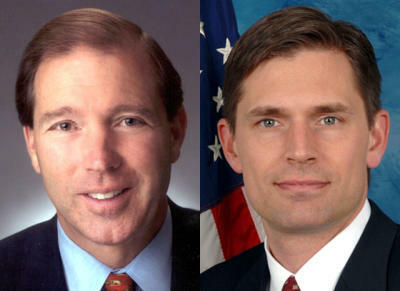 Hiemrick.. Udall.. Both you pricks better get y'alls crap together and figure out who y'all work for or.. Your going to have to get real jobs.. Which neither of you can do.. Everyone beyond Albuquerque and Santa Fe is sick of you no working policitions taking your kickbacks at our expense.. Call me.